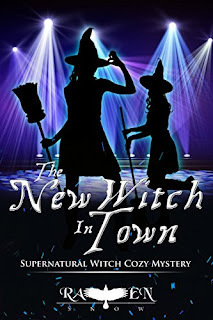 Harper "Foxxy" Beck--somewhere in-between Book# 1 "Roller Rink Witchcraft" (see my review here) and this one Book# 12) got married to the police detective and found herself a stepmom to his son. Foxxy's Grandmother is again featured in this edition and Foxxy is still petrified of her! "Foxxy" is pregnant--every indication points to this fact-for some reason she doesn't want to tell her husband--even though she knows he will be happy. To make matters worse--her "powers" have gone haywire!! So off she goes to Granny--who confirms that is because she is pregnant--not what Foxxy wants to hear! There are too many mysteries going on which she wants to solve. To make matters even stickier--there is a witch hunter in town!! I found myself laughing out loud at some of the antics and cringing at others. The main question remains--will Foxxy find the courage to tell her husband she is pregnant and just who is this New Witch? To find this out you will have to read this book--I can guarantee you will enjoy this one. The town of Waresville can seem a little backwards to outsiders. People don’t run from what goes bump in the night; they make a profit off it. Founded by persecuted witches looking for a little respite, the town changed its status to “tourist trap” a long time ago. And God help anyone who challenges the citizen’s strange livelihood. Holding the state track meet in this strange town seemed like a no brainer to the local spooky tour buses and magic themed restaurants. But when the games are threatened by a new witch, it becomes clear that Waresville has a lot more to lose than to gain from exposure. In walks Harper Beck, a local witch and owner of the grooviest—and only—disco skate in town. Harper spends her nights boogying and her days sticking her finger into every pie in Waresville. When she catches wind of a new witch terrorizing the high school, she thinks she’s found her next mystery. But matters are complicated when a newcomer rides into Waresville. Ethan, a man who’s all smiles, takes an instant interest in Harper. And not because she looked stellar in her neon, green Afro wig. If Harper isn’t careful, she might just run afoul of this dangerous stranger. But physical danger isn’t the only threat that’s lurking in Waresville. Harper has a secret. One she can’t tell her delicious, detective husband or her sweet, book-nerd stepson. If Harper isn’t careful, she might end up ally-less and caught in a witch hunter’s trap. Twelfth Volume of the Harper "Foxxy" Beck Mystery Series. Approx. 50,000 words in length. It is a standalone (reading prior or future volumes not required to enjoy the book, no cliffhanger). Sounds like a light hearted read. Wouldn't it be fun if the new witch was indeed Foxxy herself not knowing what her powers are doing? I believe she will tell her husband just as he is about to find out himself. This sounds like a very interesting plot! I'll have to check it out. I've been reading the Harper Foxxy Beck series as they are published and I'm glad to know the 12th edition is out.